Automatic thread trimmer & auto devices. 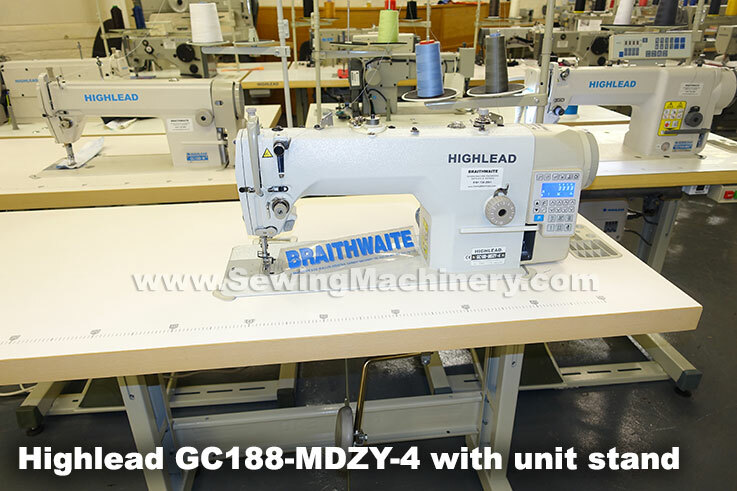 Highlead GC188 MDZY-4 direct drive industrial sewing machine with thread trimmer, for general purpose use on light to medium weight garments and materials. 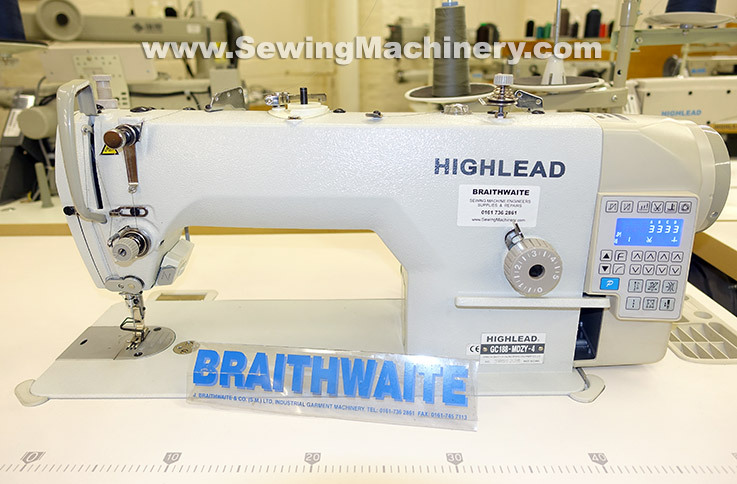 Equipped with an automatic thread trimmer which is mounted under the needle plate for quick & accurate cutting of thread at the end of a sewing cycle. This can save considerable time when compared with manual cutting of threads using scissors etc. A powerful direct drive energy saving servo motor is fitted directly onto the sewing machine head; replacing the bulky motor usually found mounted under the table on conventional models. The Highlead Direct Drive motor system offers improvements including: quick start and stop, accurate positioning, low noise, little vibration, smooth acceleration and a feeling of greater responsiveness for the operator. Power consumption on the GC188-MDZY series is up-to 50% lower when compared with conventional V belt driven models; offering long term energy savings. The maximum sewing speed is push button adjustable allowing the operator to select a suitable running speed matched to the job at hand. Speeds as low as 200 stitches per minute can be set for intricate operations or to allow an inexperienced operator time to get comfortable with using an industrial machine. In addition, at higher speeds, the machines smooth acceleration control allows for a very slow start with increasing speed as you press the foot pedal harder. Standard equipment includes: a knuckle operated reverse device; which is positioned just above the foot and allows you to reverse stitch without having to move your hands from the sewing area. An optional automatic electric foot lifter device is available (if fitted this replaces the manual knee lifter) with semi-auto and fully auto foot lifting options.